California is a popular place to get away for an elopement, for good reason. 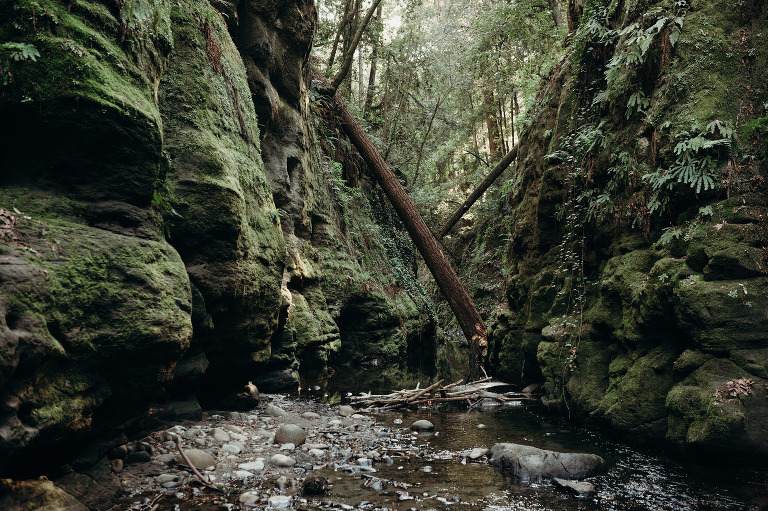 Recently the most popular places to elope in California have been Big Sur and Yosemite. A quick look at instagram will tell you that couples and photographers have been flocking to those places like crazy. Now, I LOVE both those places, but I think Santa Cruz is a totally underrated destination that ranks up there with the scenery. The best part is that it’s not hard to access, unlike Big Sur and Yosemite. Santa Cruz is located south of the San Francisco Bay Area along one of the most gorgeous highways in the world. It is within an hour of two major airports, yet it feels like a secluded vacation-land. Our little town is sandwiched between a dramatic coastline and some stunning coastal mountains covered in redwood forests. Many people think of the famous Santa Cruz Beach Boardwalk when they think of this area, but it is so much more than that! I offer elopement experiences for couples looking to elope somewhere gorgeous in the outdoors. Eloping is about having an adventure, so I like to make it feel very special for each couple. We will collaborate to pick from the many location options I’ve collected while hiking and exploring on my own. Or, I can just surprise you with a destination! Wherever we go during your elopement, it is my priority to make it feel meaningful. Sure, we are going to take lots of fun portraits, but I also believe that your wedding isn’t a photo shoot. It’s about creating real, meaningful and fun memories. Let’s go for an adventure. Nisene Marks is one of my favorite local spots to hike because there is always something new to discover. 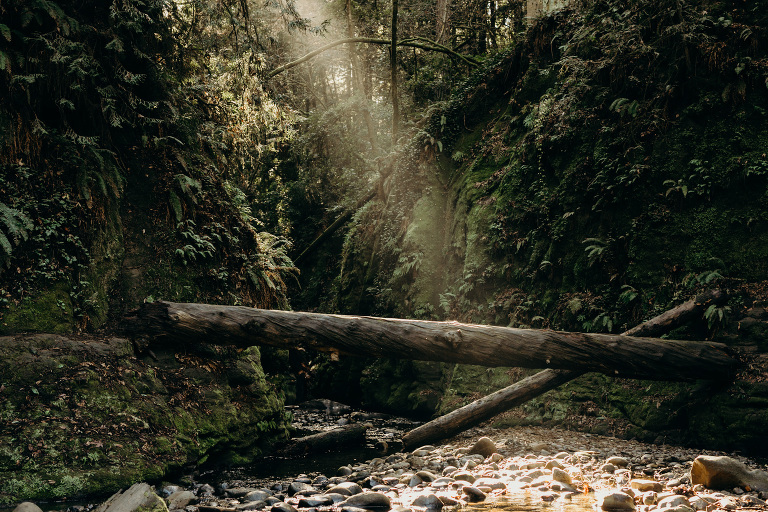 This lush redwood forest has a big network of trails, picnic areas, camping spots, creeks, and waterfalls. It’s a popular spot for Aptos locals to go for a trail run or walk their dog on weekends, but once you get off the main fire road you could easily have the park to yourself. Below is one of my favorite new spots in the park that I found by accident while hiking. It would make a gorgeous site for an elopement or micro wedding. It is easily accessible but I rarely see anyone down there! Check out the full blog of this shoot here. Shark Fin Cove is easy to miss if you’re driving along Highway 1, but if you pay attention you’ll catch a glimpse of the giant rock shaped like a shark fin. The beach itself is tiny and beautiful, but usually a little crowded. Up above you get a much better view of the scenery, plus a nice flat trail that continues along the bluffs. This spot is easy to access, gorgeous and makes for a great backdrop to an elopement ceremony. It is located off of Highway 1 between Santa Cruz and Davenport. Check out the full blog post of this elopement inspiration shoot here. Davenport, California has it all! Crazy views in every direction atop huge bluffs, a cypress grove, a picturesque beach that looks otherworldly in the fog, and nice meadows! Afterward you can walk across the street from the parking lot to celebrate at one of the local bars in this tiny town. Davenport is in Santa Cruz county and located about 15 minutes north of the city of Santa Cruz. 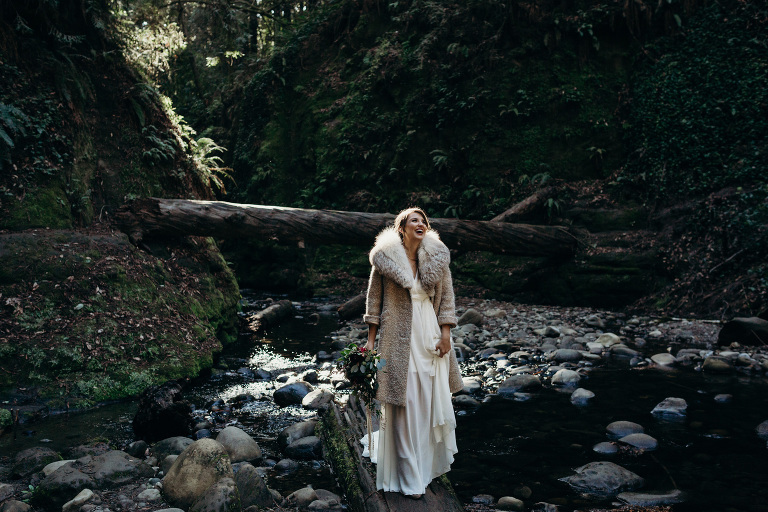 Check out the full blog post of this elopement inspiration shoot here. Panther Beach is another incredible coastal spot right off of Highway 1 just 5-10 minutes from the west side of Santa Cruz. A natural arch in the cliff gives you access to an entirely separate beach when the tide is lower. I love the red and orange tones and texture of the cliff walls at this beach. One of my favorite things to do at Panther Beach is climb up on a rocky point that juts out from the cliff on the north end of the beach. You can only do it in low tide, but it’s spectacular! If you try it- please be careful and pay attention to whether the tide is going in or out. It’s easy to get stuck if you’re not being careful. Check out this post and also this one for more photos of Panther beach. Are you interested in eloping but not quite sure yet? Are you stuck on how to plan it or where to go? Send me a note and I’d love to help you out. I love giving couples a full-on experience that involves help with planning in addition to photography. Want to check out some of our local wedding venues? 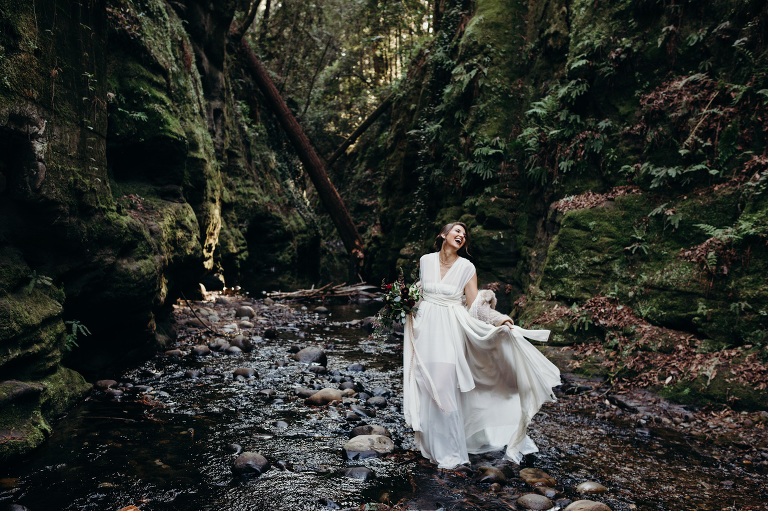 Head over to this post on my favorite wedding venues around Santa Cruz County.